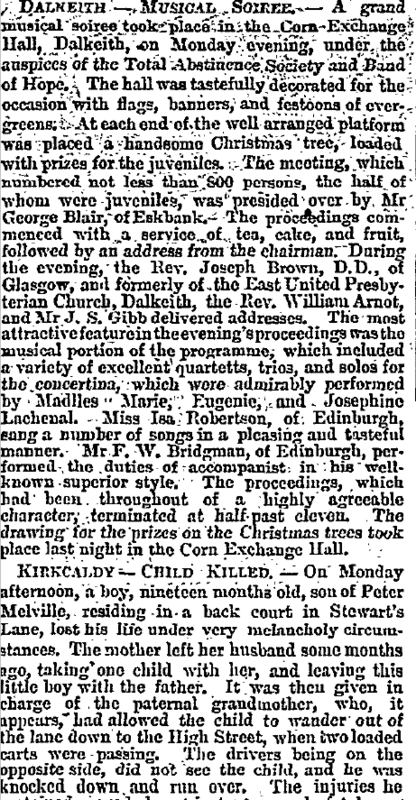 Clippings from the archives of The Scotsman newspaper, Edinburgh, tell the story of the visit to Edinburgh of three teenaged daughters of Louis Lachenal for three months over the Christmas season of 1865–1866. 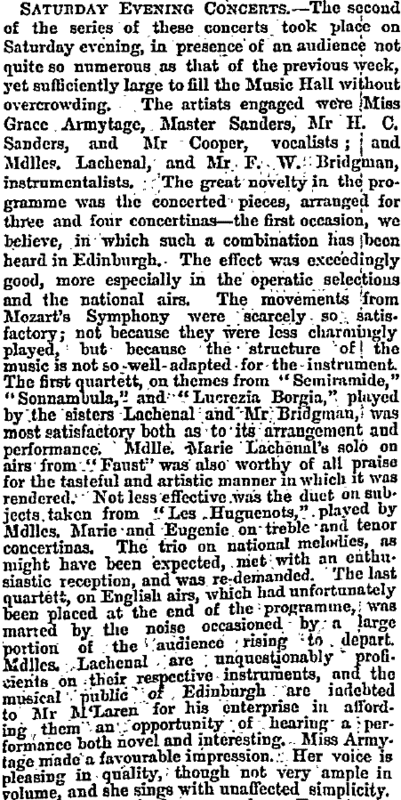 They apparently introduced to Edinburgh the playing of "concerted music" on multiple English concertinas. When playing as a trio, the three ladies are recorded as playing “treble, tenor, and bass concertinas”. They extended their trio to a quartette by the addition of a popular local Edinburgh concertinist, with a second treble. 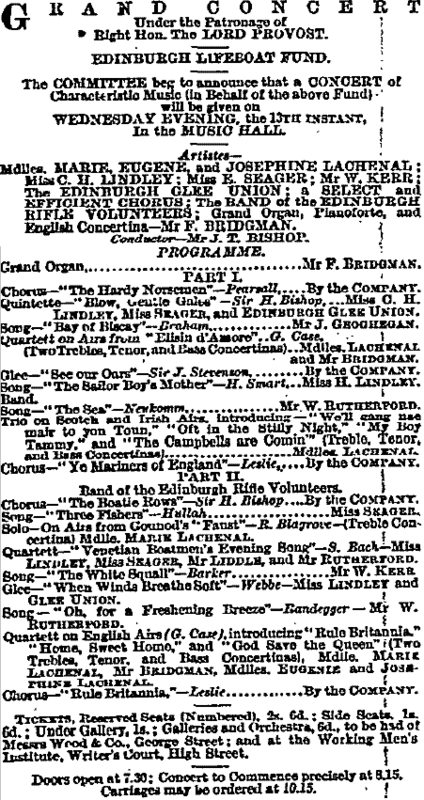 They appeared in at least four “Saturday Evening Concerts” held about once a month at the Music Hall behind the Assembly Rooms in George Street, Edinburgh. This is a very large domed hall (added in 1843), capable of holding several hundred people and still in use; Regondi had performed here earlier, Dickens gave readings in this hall at the same period (between 1858 and 1867), and more recently so did J. K. Rowling. They also appeared at some very large concerts organized as charitable benefits. Thus, at exactly the same time as the daughters’ visit to Edinburgh, it was becoming very important for the Lachenal company to raise the visibility of Lachenal-branded concertinas as alternatives to the better-known Wheatstone-branded concertinas: they would in the future receive revenue only from sales of their own Lachenal brand. The three young Lachenal sisters with their elegant French names would have been the perfect celebrity endorsers, whose mere appearance on a programme could put the Lachenal company name into the newspapers. 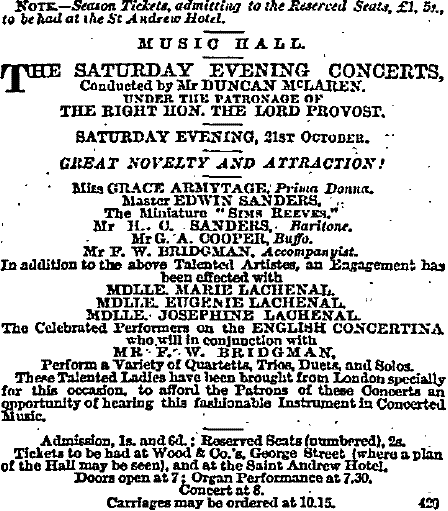 In mid-October of 1865, the first notice that the Lachenal sisters have been “brought from London especially for this concert” in order that Edinburgh audiences might have an opportunity to hear "this fashionable instrument" (the concertina) played in "concerted music". 18 October 1865, page 1. Perform a Variety of Quartetts, Trios, Duets, and Solos. Admission, 1s. and 6d; Reserved Seats (numbered), 2s. Doors open at 7; Organ Performance at 7.30, Concert at 8. Carriages may be ordered at 10.15. The notice was repeated the following day, again introducing the "Talented Ladies". 19 October 1865, page 1. 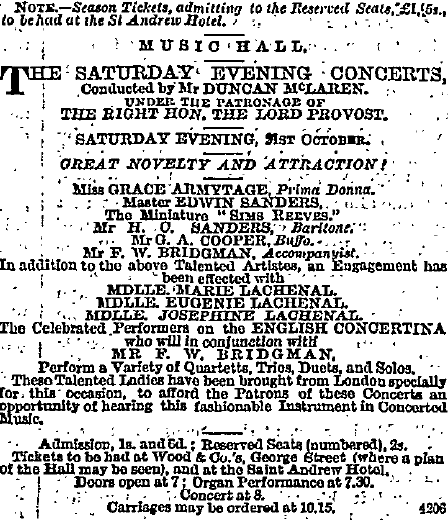 On Saturday 21 October 1865, the day of the concert, the notice is repeated once more, along with an editorial mention. 21 October 1865, page 1. 21 October 1865, page 2. Mozart's Quartett in F major, played on four concertinas. 23 October 1865, page 2. 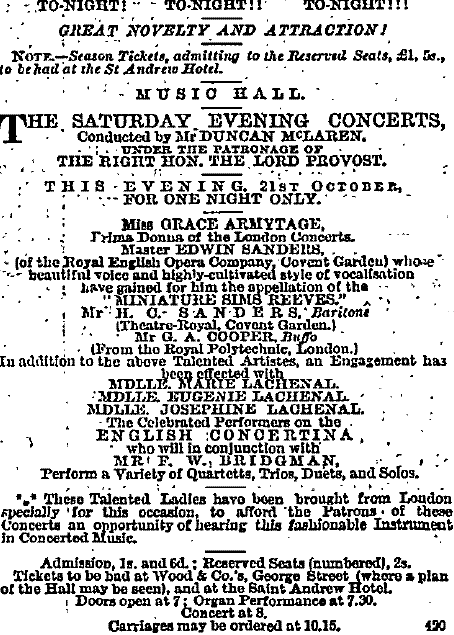 After the successful concert on Saturday and the good review on Monday, the impressario Duncan M'Laren inserted an advertistement two days later addressed to “managers of concerts, soirees, &c.” with the news that the Lachenal sisters were available for further engagements, and with their local concertinist they were the “Concertina Quartette”. 25 October 1865, page 1. Profession are also open to Engagements. Mr. M'Laren repeated his offer the following Saturday, a week after the first concert. 28 October 1865, page 1. 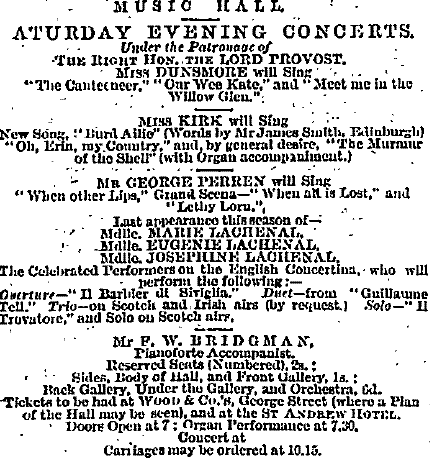 The next Saturday Evening Concert by the Lachenal sisters was three weeks after the first. In the first brief advertisement he sisters are listed as “the Misses” Lachenal. 07 November 1865, page 1. By the time of the full announcement on the day of the second concert, the sisters have once again regained their usual French titles. This announcement includes the highlights of the material they will play, mostly in trios and quartettes. The bulk of the music has been arranged by George Case. 11 November 1865, page 4. Tenor, and Bass Concertinas), G. Case. Pianoforte), Sydney Smith and R. Blagrove. Trio on Scotch Airs, Introducing "Logie o'Buchan,"
"Comin' thro' the Rye," "Within a mile o' Edinburgh toon,"
my lad" (Two Trebles and Bass Concertinas), G. Case. 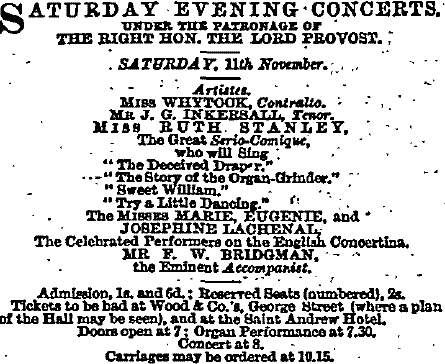 Quartett on English Airs, introducing "Rule Britannia,"
Mr. F. W. Bridgman, Accompanist. 13 November 1865, page 2. Bridgman formed a most important feature in the concert. Britannia," "Home, sweet home," and "God save the Queen." provision so considerately made for their entertainment. 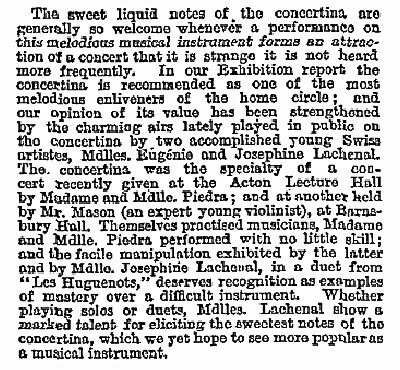 Following the successful second concert, Mr. M'Laren inserted another advertisement again offering the availability of the Lachenal sisters. 18 November 1865, page 6. Mr Duncan M'Laren, St Andrew Hotel. A third major concert was announced for Wednesday the 13th of December, not in the same Saturday series as the two preceding ones. This concert was for the benefit of the Edinburgh Lifeboat Fund charity. 09 December 1865, page 4. Right Hon. The LORD PROVOST. Tammy," and "The Campbells are Comin'"
(Treble Concertina)   Mdlle. Marie Lachenal. Quartett on English Airs (G. Case), introducing "Rule Britannia,"
"Home, Sweet Home," and "God Save the Queen"
Mr Bridgman, Mdlles. Eugenie and Josephine Lachenal. Institute, Writer's Court, High Street. Doors open at 7.30; Concert to Commence precisely at 8.15. 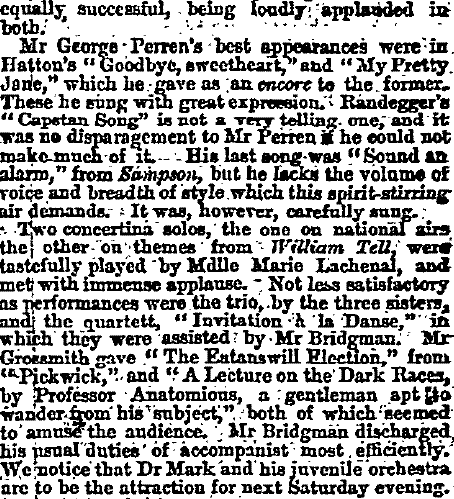 14 December 1865, page 2.
selected my Miss Lindley, "The Sailor Boy's Mother,"
encores should be insisted on, she had to repeat. or the vocal cheers at the last verse. Neukomm's "The Sea,"
by Mr Rutherford, and "The White Squall," by Mr Kerr. 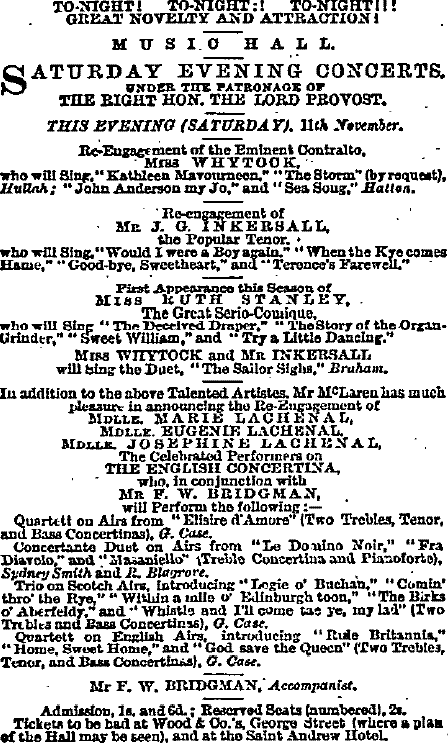 setting of Campbell's noble song, "Ye Mariners of England,"
The next Saturday Evening Concert with the Lachenal sisters was on 16 December 1865, five weeks after the previous one, with the “re-engagement” of the “Celebrated Performers on the English Concertina” featured in the advertisements. 15 December 1865, page 1. The Celebrated Performers on the English Concertina. 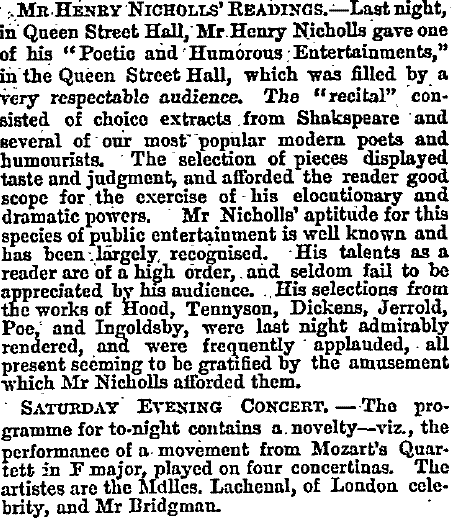 A review of the third Saturday Evening Concert with the Lachenal sisters showed that the press was still very happy with the concertina performances. 18 December 1865, page 2.
which they were assisted by Mr Bridgman. 27 December 1865, page 2.
cake, and fruit, followed by an address from the chairman. the Rev. William Arnot, and Mr J. S. Gibb delivered addresses. a number of songs in a pleasing and tasteful manner. Mr F. W.
Christmas trees took place last night in the Corn Exchange Hall. 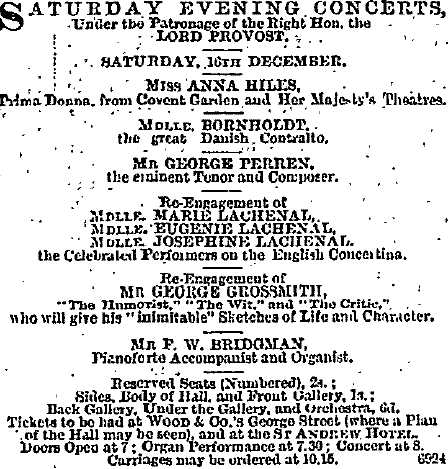 The final Saturday Evening Concert for the Lachenal Sisters was on 20 January 1866, “last appearance this season”. No review of this concert could be found in the Scotsman for the following Monday as usual. 20 January 1866, page 4.
request)  Solo--"Il Trovatore," and Solo on Scotch airs. 6 May 1871, page 283.
artistes, Mdlles. Eúgénie and Josephine Lachenal. New photographs, genealogical data, and information about Marie Lachenal, eldest of Louis Lachenal’s daughters, and about her family life as the wife of the photographer Edwin Debenham. First published in PICA [Papers of the International Concertina Association], Vol. 2 (2005), pp. 1–17. The web version adds large colour photographs and additional information which has been discovered since the text went to print. Announcement advertising the availability of Marie Lachenal for performances and lessons, with numerous press clippings listed. Discussed in Faye Debenham and Randall C. Merris, "Marie Lachenal: Concertinist". Discussion of the sources of information available about Louis Lachenal, his early career and immigration to England, and his involvement with the design and manufacturing engineering of Wheatstone & Co. concertinas up to the year 1848. As published in The Free-Reed Journal, Vol. 1 (1999), pp. 7-18. There is also a scanned copy of the original publication in PDF format. New evidence for the role played by Louis Lachenal in the early manufacturing history of C. Wheatstone & Co., and some points of reference to use in seeking to date Lachenal concertinas. As published in PICA [Papers of the International Concertina Association], Vol. 1 (2004), pp. 3-23. Better-quality colour photographs from the author's originals have been substituted for those originally published. A full transcription of the booklet published by William Cawdell in 1865 in which he attempts to recommend all the advantages of the new English Concertina providing some history, some opinions about contemporary performers, and some record of press reaction to the instrument. Allan Atlas has provided two contemporary reviews of Cawdell’s efforts. This transcription is based on two copies of the booklet, one in the New York Public Library (“1865”) and the other in the British Library (“1866”). These appear to be two printings of the same type with an altered title page. Links are provided to PDF scanned versions of both original documents. Concertina Library directory of all information on this website about Richard Blagrove. This study looks at the 978 women for whom there are 1,769 transactions—about 12% of the total—recorded in nine extant Wheatstone & Co. sales ledgers that list the firm’s day-to-day sales from April 1835 to May 1870. It is in two parts: (1) an Introduction, which analyses the data presented in the Inventory from a demographic-sociological point of view and places Wheatstone’s commerce with women into the context of its business activity as a whole; and (2) the Inventory (with three appendices), which lists every transaction for each of the 978 women, identifies as many of them as possible, and offers a miscellany of comments about both the women and the transactions. Royal Musical Association Research Chronicle v. 39 (2006). 239 pages. Briefly, the roster of Wheatstone’s female customers reads like a list of Victorian England’s rich-and-famous: the Duchess of Wellington and 146 other members of the titled aristocracy (more than twice as many as their male counterparts), the fabulously wealthy philanthropist Angela Burdett Coutts, members of the landed gentry, and such mainstays of London’s musical life as the guitarist Madame R. Sidney Pratten, the organist Elizabeth Mounsey, and the contralto Helen Charlotte Dolby, as well as a large number of Professors of Concertina. Complete digitized archives from 25 January 1817 to 1950.